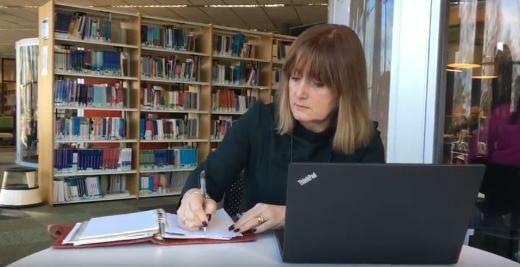 As Solutions Manager at leading public sector services provider Serco, Lesley’s role involves working in the Business Development Unit specialising in Education, Skills and Enterprise. The University of Wolverhampton formed a three-year partnership with international company Serco to deliver one of the first CMDAs in the country, and Lesley says she thought it was an “ideal opportunity” to develop her skills and knowledge. The partnership enables selected Serco staff to study the Degree Apprenticeship, which is work-based with a mixture of blended learning including lectures and distance learning materials. Students also have access to in-house company mentors and training support. The Degree Apprenticeship covers all aspects of business including management, marketing, human resources, finance and operations management. Lesley, who is in her 50s, says: “I really do believe you should be honing your skills throughout your career. The term “Apprentice” conjours up a stereotype; I am not what you would perceive to be a ‘typical’ Apprentice but the course is interesting because it enables me to do it while working. I am really proud to help correct the view that Apprenticeships can only be undertaken by school leavers. “I really enjoy the CMDA because the subjects we cover are very relevant to the work scenario. The good thing is it brings theory back in and makes you revisit areas that perhaps you are not as strong on and also introduces you to new areas that are relevant to your work life. “The University of Wolverhampton has been extremely supportive. The nature of the course is that it is an online learning course, but two days are spent in a workshop scenario before each module and that is really valuable - you get to meet the University facilitators and coaches and that’s great. “Then you are on your own and that can be good and bad at the same time. The good part is that you can study at your own pace and still have support, but the bad is that you have to be good at time management! “I’m a real advocate of lifelong learning. I don’t believe that you can go to school, college and then University and enter the workplace and be ready for the rest of your career. I really think you have to make yourself relevant in the workplace. For more information about Degree Apprenticeships contact the Apprenticeship Hub at the University of Wolverhampton.